This week's Friday Strat is a day early due to my holiday scheduling -- better early than never! Happy Thanksgiving!!! Our featured item is currently listed at eBay by a guy who received this Strat from Neal Schon in payment for developing Schon's current website. The guitar was built by Greg Fessler at Fender Custom Shop to Neal Schon's design specs. Not part of a Custom Shop artist series, this is a build Neal Schon ordered for his 2005 - 2007 Journey touring arsenal. You can read all the details at the listing. Some interesting mojo and goodies, as well as COA are included with the guitar. I'm intrigued by the pickup config. Besides utilizing a Hendrix reverse layout, the bridge position utilizes two stacked singles. That's right. Not a humbucker-- check out the pole offsets from the slant, and also notice the coils are independently height adjustable. 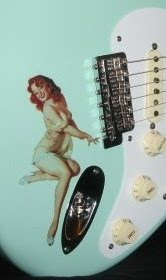 The Hendrix angle promotes tight bottom tones and less twang for the high strings. The Floyd bridge is recessed, and the fretboard is ebony. You're looking at a pro designed & set up Masterbuilt instrument, intended for high level pro use!